Book A Snowmobile: GTX REV 550 – The Grand Touring 550 is a 2-up grand touring long-track with electric start, push button reverse, heated hand & thumb warmers and heated helmet plug in (for driver). The storage compartment has enough room for a bottle of water, snack, map and cellphone. There is a luggage rack on the back to attach additional gear. Need Snowmobile Gear? It is cold out there and don't fret, if you don't have the gear, we have a full stock of snowmobile clothing available for rent - your helmet is included with your rental, we have bibs, jackets, boots and gloves available for rent and we sell face-masks at the front desk. Our Katahdin jackets are warm and comfortable. Our customers come in all shapes and sizes so we will most likely have your size, be it petite or xxxl. Half day snowmobile rental prices are not available on Saturday. Gas and oil are not included in the rental price. Breakfast, Lunch and Dinner is available daily at our River Driver’s Restaurant. 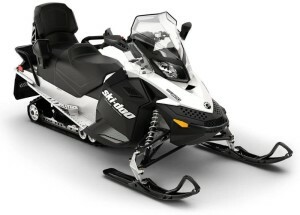 To Operate Sled: Must be 18 with valid driver’s license OR 16 with valid driver’s license and signed parental permission. To Ride Sled: Must be 9 years or older to be a passenger. 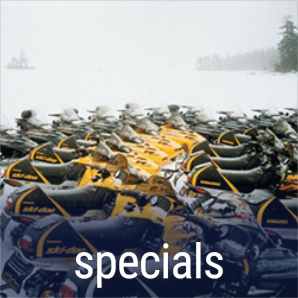 As required by our insurance company and Maine law, guests must watch a 15-minute snowmobile safety video. We encourage guests to arrive together to watch the video or watch online in advance. 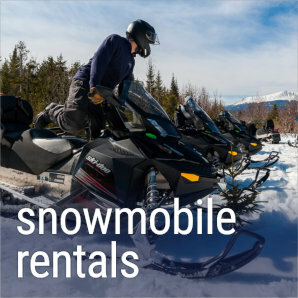 In order to rent a snowmobile in Maine, a security deposit is required in addition to your rental fee. The deposit is held until the rental sled is returned and checked for damage. The security deposit is $1,000. You must have $1,000 available on your credit card (AMEX, MC, Visa, Discover) or cash/bank check (no personal checks). If the sled is returned with damage, the cost of repairs will be deducted from your security deposit. Any remaining funds will be returned to you. In the unfortunate event of a total loss, the deposit will not be refunded. 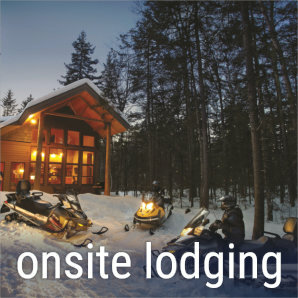 Call 1-800-634-7238 to ask us about the current weather conditions and to customize your perfect snowmobiling experience. Our fleet is the largest Rental fleet in the State of Maine. We are licensed, insured outfitters located at NEOC/ Twin Pine Cabins on Millinocket Lake trail-side to ITS86. To give you peace of mind, our sleds are maintained on-site. 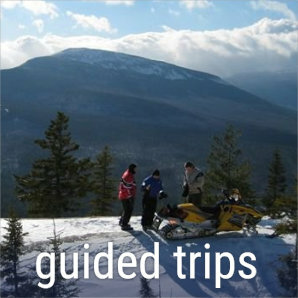 We offer guided day and overnight snowmobile trips or you can rent one of our Rental sleds and explore the Maine woods on your own. We offer a full line of comfortable, warm, rental clothing. Because of our commitment to safety, each sled rental includes the rental of a helmet that is required to be worn at all times. We continually update our fleet with new sleds. 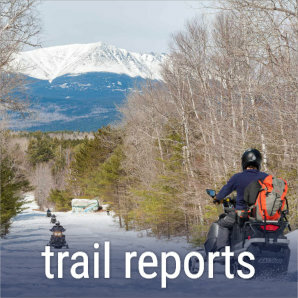 Twin Pine Snowmobile Rentals offer sled rentals at NEOC/Twin Pines on Millinocket Lake, ITS-86. Gas and oil sales are available right on-site and we have an award-winning restaurant open for breakfast, lunch and dinner during sled season. For any unexpected repairs, we also offer access to an on-site heated garage. 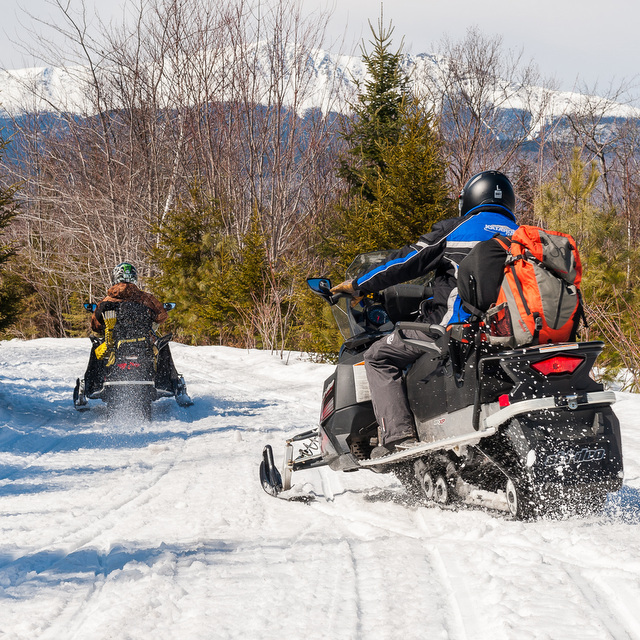 For your convenience, there is also a snowmobile repair shop within 20 miles that has mechanics on-site to get your own personal snowmobile back on the trails. Call 1-800-634-7238 to ask us about the current weather conditions and to customize your perfect snowmobiling experience, or book online!